One cannot build responsibly today without incorporating some sustainable practices into the design and construction. In residential building, this can range from the installation of high-rated insulation and energy-efficient appliances to solar panels and geothermal pumps. We have experience in both simple and elaborate approaches. Our interest in sustainable practices began long before the current green movement gained momentum. We're often commissioned to design an addition to a period house from the 1930s or earlier. Through researching traditional details and working with master craftsmen trained in the use of traditional building methods and materials, we've discovered that, prior to World War II and the advent of air conditioning, houses were built to respond to local climatic conditions, used cost-effective methods, and used locally sourced materials. Today, we continue to apply these Heritage Sustainable strategies to build homes with smaller carbon footprints. We have also expanded our use of new green building technologies. 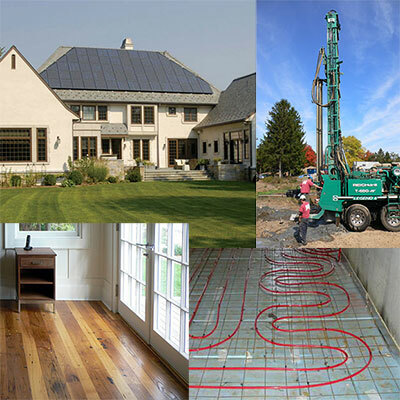 Several of our recent projects incorporate geothermal heating and cooling systems, solar panels, radiant heating, and super-efficient spray foam insulation.